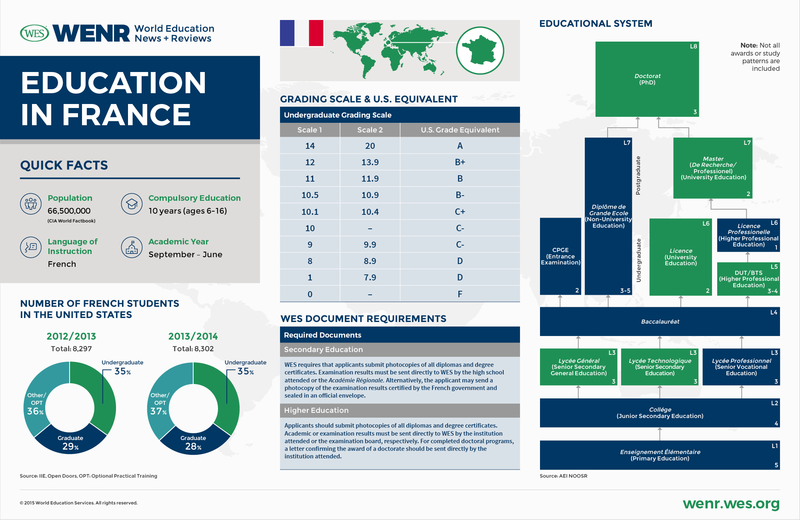 In this article, we provide an overview of the French education system, with a look at the structure, credentials and recent history. We also take stock of French efforts to internationalize the education system, both in terms of outbound and inbound mobility. Education is a priority in France, with 21 percent of the annual national budget earmarked for education. The country boasts a 99 percent literacy rate. France’s higher education history is lengthy. The University of Paris, one of the world’s oldest universities, was founded in 1215. Prior to 1789, education was controlled by the Catholic Church. After the French Revolution, a standardized and centralized education system was instituted. For administrative purposes, France is geographically divided into 31 educational regions known as académies. Each académie is headed by a recteur, a representative of the Ministry of Education, who is in charge of all education levels within that region. Each académie is further divided into départements, which are headed by an inspecteur d’académie, who oversees primary and secondary education. A law adopted in 1989 established that while the Ministry of Education is responsible for creating the curriculum and setting educational standards and goals, each primary and secondary school has the autonomy to choose how to best teach the curriculum and achieve state-determined educational goals. In the 2013-2014 academic year, 8,302 French students came to study in the United States. France is the 15th highest contributor of international students to the United States and these students have contributed $287 million to the U.S. economy. Most French students in the U.S. study at the undergraduate level (a total of 34.5 percent), with 28.3 percent studying at the graduate level and 37.2 percent of the French students in the United States participate in other types of programs (including Optional Practical Training). Enrollments among French students coming to the United States rose throughout the 1990s to a peak of 7,401 in the early 2000s. A three-year decline followed September 11th, 2001, but French student numbers have been on a consistent growth trajectory since the 2005-2006 academic year, with a record of 8,302 studying in the United States in 2014. The French academic school year runs from September until June. Examinations are typically offered in June, with a second set of retake examinations scheduled in September. In France, education is compulsory between the ages of 6 and 16. Elementary school (enseignement élémentaire) begins at age 6 and lasts for 5 years. It is divded into two cycles: the basic learning cycle (two years) and the consolidation cycle (three years). Elementary education focuses on French, mathematics, reading and writing, social sciences, science and the introduction of a first foreign language. Following elementary school, students enroll in secondary school. Secondary education is divided into two levels: lower secondary (enseignement secondaire du premier cycle) and upper secondary (enseignement secondaire du deuxième cycle). Lower secondary education is taught at middle schools (collèges) and is open to all students who have completed elementary school. The program is four years in length and consists of four grades numbered in descending order. Studies begin in year six (sixième) and end in year three (troisième). The curriculum focuses on French, foreign language, mathematics, history and geography, life and earth science, physics and chemistry, art, technology, music and physical education. At the end of lower secondary school, students take a national examination in one of three streams: academic, technological or vocational. Those who pass the examination earn the Diplôme National du Brevet (DNB). Those who fail the examination earn a school-leaving certificate called le Certificat de Formation Générale (CFG). Upper secondary school is three years in length and is comprised of years 10, 11 and 12 (called seconde, première and terminale). Upper secondary education takes place at high schools (lycées). Access is granted to students who have the DNB and to a very limited number of students with the CFG. At the end of the first year (seconde), students choose a stream of study that will be followed for the final two years of upper secondary study leading to the baccalauréat examinations. The general academic stream culminates in the diplôme du baccalauréat général. The technology-based stream earns students the diplôme du baccalauréat technologique and the vocational stream leads to the baccalauréat professionnel. All three types of baccalauréat grant students access to university studies. Students who fail the baccalauréat examination are issued the certificat de fin d’études secondaires. Students who are enrolled in vocational programs may also earn the Certificat d’Aptitude Professionnelle (CAP) and the Brevet d’Etudes Professionnelles (BEP), both of which are terminal degrees intended to give the students access to jobs in their chosen industry. The baccalauréat examinations are offered in June and September every year. The academic stream is offered in three concentrations: literary (L), economic and social sciences (ES), and scientific (S). Students follow a curriculum of math, science (life and earth sciences or engineering sciences), physics and chemistry, philosophy, languages, civics, social science and physical education during their final year of study. Students in the literary stream focus their coursework on languages, history and geography, the arts and literature. Students in the science stream focus their coursework on science and mathematics, while students in the economic and social science stream focus on economics and social sciences, history and geography, mathematics and languages. The technology stream has concentrations available in industrial science and technology, laboratory sciences, health sciences, hotel and tourism, management, music and dance, and environmental science. The vocational stream has concentrations in many different specialties, including sales, accounting, automotive mechanics and graphic design. It prepares students to enter the job market, but also provides access to higher education. Admission to higher education is based on the baccalauréat examination. Some selective higher education programs, offered at the grandes écoles, require students to take a competitive examination (concours) for entrance into the program. In order to take this examination, students generally complete two years of preparatory study (classes préparatoires) at specialized high schools (lycées). The BTS is a two-year technical degree awarded by the Ministry of Education. Admission to the BTS is competitive. The BTS is earned after the completion of two years (120 ECTS credits) of preparatory study in a lycée and the passing of a national examination. Those who have earned a BTS can proceed into the workforce, or use it for access to further study in bachelor’s programs in engineering or business. The two-year programs are offered at IUT, which are independent institutions affiliated with universities. These programs culminate in the diplôme universitaire de technologie (DUT). Admission to IUT is competitive. This degree is designed to prepare students for employment in their field of study, but also gives access to university degree programs. There are 83 public universities in France, and 80% of the tertiary student population attends these institutions, as they are very accessible, affordable and offer many programs of study. The L-M-D structure instituted under the Bologna Process reforms created a three-tiered system of education at the universities: the bachelor’s degree (licence), the master’s degree (master) and the doctorate (doctorat). Admission to diplôme de licence programs is based on the baccalauréat, the national school leaving certificate. The licence degree is issued after three years of study and 180 ECTS credits. There is also a professional version of this degree called the diplôme de licence professionnel for students who hold the BTS or the DUT (see above). The program is one year in duration and requires the completion of 60 ECTS credits. Following the licence, students may continue studies at the graduate level. After two years of study and completion of 120 ECTS credits, they earn the grade de master. The master allows students access to the third cycle of education. The third cycle of education leads to the doctorat. It requires a minimum of three years of study and the completion and defense of a thesis. The professional programs in medicine, dentistry and pharmacy all begin with a common year of health-related study (première année commune aux etudes de santé). After the first year, students must sit for a competitive examination. This limits the number of students eligible for further medical, pharmaceutical and dental study. Medical study is offered at universities and is grouped into three cycles. The first medical cycle (premier cycle en médicine) requires two years of study, one of which is the common year (see above).The second cycle (deuxième cycle en médecine) requires four years of study. The third cycle of medical study varies in length depending on the program chosen. Students that follow the general program complete a three-year residency (résidanat) and defend a thesis to earn le Diplôme d’État de Docteur en Médecine (State Diploma of Doctor of Medicine). This allows the holder to practice general medicine. For students following a specialist program, the third cycle requires a four or five year internship (internat). After completion of the program and defense of the thesis, students earn the Diplôme d’État de Docteur en Médecine and le Diplôme d’Etudes Spécialisées (Diploma of Specialized Studies) is awarded after completion of the internship. This allows the holder to practice as a medical specialist. Following the first year of general health study, students complete an additional five years of study to earn the Diplôme d’État de Docteur en Pharmacie (State Diploma of Doctor of Pharmacy). This allows the holder to practice as a pharmacist. Following the first year of general health study, students complete a program of an additional five to seven years of study. This earns them the Diplôme d’État de Docteur en Chirurgie-Dentaire (State Diploma of Doctor of Dentistry). This allows the holder to practice as a dentist. In addition to universities, France is home to over 200 grandes écoles. These schools are specialized institutions, and about 30 of them are considered to be very prestigious. They offer programs in areas such as engineering, education, architecture and business administration. Admission to the grandes écoles requires the completion of two years of preparatory study and passing a competitive examination (concours). This is followed by a three-year program of study. Some schools admit students directly after the baccalaureate examination and offer a five-year program leading to a diploma in engineering. Engineering study can be completed at universities and engineering grandes écoles and culminates in the diplôme d’ingénieur (Diploma of Engineer). Entry into these programs is very competitive. Admission is usually achieved through completion of preparatory study, the DUT or the BTS and with a competitive entrance examination. The engineering program lasts three years. These are post-graduate diplomas offered at grandes écoles following a one-year program comprised of coursework, research and a thesis. Public higher education institutions operate under the authority of the State and therefore all national and university-issued diplomas are recognized. Private institutions need to apply to receive academic recognition from the Ministry of Education. Institutions can receive two levels of official recognition. The Ministry of Education can grant academic recognition by decree. Recognized private institutions receive state funding and students are able to apply for public grants. Diplomas issued by institutions with this status bear the title “établissement d’enseignement supérieur privé reconnu par l’état” (private higher education institution recognized by the State). Once an institution has been recognized for a minimum of five years, it may apply for its degrees to be validated by the State. In order for this to occur, the institution must submit to continuous reviews of its program, including the curriculum and graduation requirements, the quality of instruction, and the level of job integration after degree conferral. When the degree has been given the title visé par l’État, it signifies a standardized level of quality for the program. This status is awarded in a ministerial decree and lasts for a maximum of six years, at which point the program would have to be reevaluated to ensure quality. Degree certificate and academic transcripts for a licence bachelor’s degree in Applied Economics from the University of Paris-Dauphine.